Weather Heavy rain later this morning and this afternoon and breezy tonight. Back Creek is the center of yachting activities in the Solomons area. 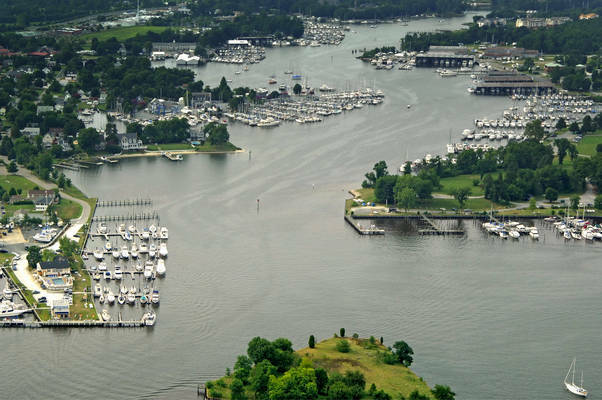 With over eight marinas crammed within one mile along its shore, there is little that cannot be provided for boaters. If youre up for a little shore time, the Calvert Marine Museum is located on the west shore of the creek, and there is a Holiday Inn farther up that has a grocery store close by. The image above is a view from the south-southeast looking west-northwest over Back Creek. In the bottom of the image is Ma Leg Island with Janes Point showing up just to the islands left (west). 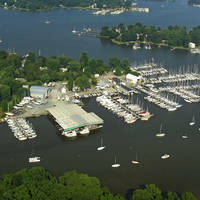 Solomons Yachting Center is located on Janes Point, and its facilities can be clearly seen. Farther up to the left (west) is the expansive Zahnisers Yachting Center, which has all services and an excellent repair staff. 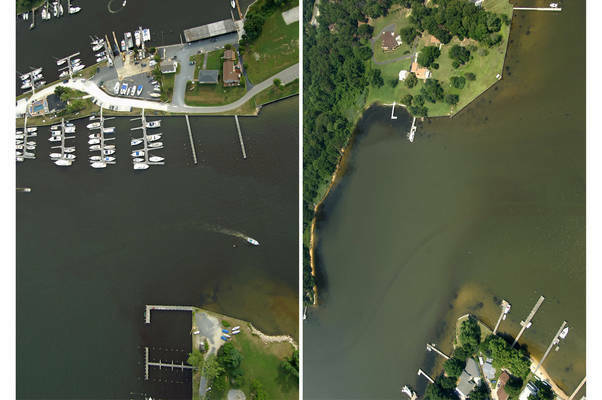 Next up on the left is Spring Cove Marina, which has plenty of transient slips, gas and diesel fuel, a lift, and marine supplies at its ships store. The last marina up on the left is Hospitality Harbor Marina, which caters exclusively to transient guests. There is also an excellent anchorage just off the marina, though it is a bit unprotected from strong fall northwesters. 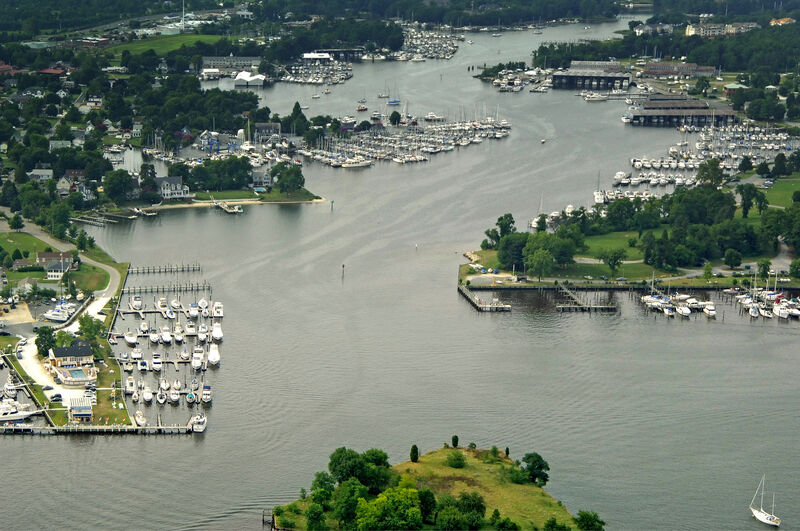 On the right (east) is Calvert Marina, an extensive transient and repair facility, while just north is Washburns Boatyard, which while not accepting transients, does have excellent repair facilities. 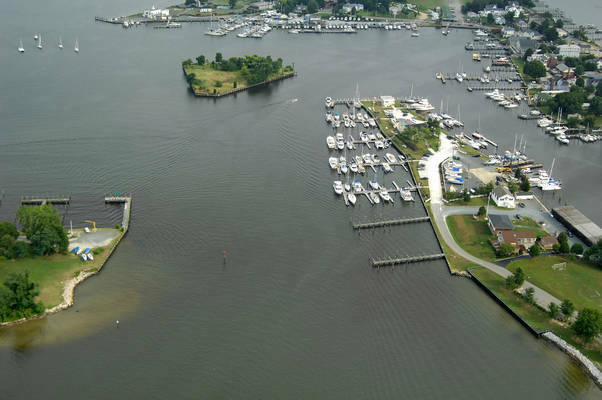 Access to Solomons Islands two creeks is via a shared entrance south of Ship Point just west of Ma Leg Island. Ma Leg Island is not charted with a name, but it is easily recognizable both on the chart and in person. The triangular island has sturdy breakwaters and two flashing red lights (2 and an unnumbered aid). 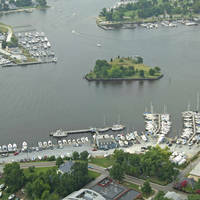 Behind the island to the west is a popular anchorage just off Solomons restaurants and attractions. Do keep in mind that these attractions can be quite noisy at night, however. Next, continue north toward red daybeacon 2 and flashing green 3. At flashing green 3 head toward red daybeacon 4, where you can head in toward Back Creek past Ma Leg Island. If you are coming up the Patuxent River from the east, it is easiest to travel north of the aforementioned shoal into Back Creek and Solomons, but do not cut any of the markers on this channel too close; there is shallow water right near them, so give them room. Green daybeacon marks the start of the approach near waypoint N38 19.265 W76 23.102. Red daybeacon 2 is just north of green daybeacon 1. From here, set an approximate course of 280 degrees magnetic for about .6 mile to intercept green daybeacon 3 and red daybeacon 2A. Soon after, you will find red daybeacon 4 at the shred mouth of Back and Mill Creeks where you can head your way in past Ma Leg Island. No reviews yet! Be the first to write a review of Back Creek Inlet - Solomons.